The 2018-2019 school year marks a significant milestone, our 20th birthday, and we plan to celebrate the entire school year! The party started at the first SLPA meeting and Parents’ Night event on Tuesday, September 11th with cupcakes and a rousing rendition of the Happy Birthday song by faculty, staff, and families. 107.7 The Truth was on location all afternoon and Bill Shelnutt and Emily Sutherland were on air sharing all about the St. Luke School experience. Each family then visited classrooms and received a 20th anniversary yard sign to display their Lion Pride all year. 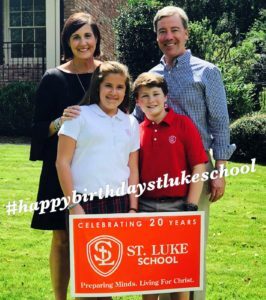 Families were asked to share photos of their Lions next to their yard signs via social media using the hashtag #happybirthdaystlukeschool. It was truly a happy start to an exciting year. Stay tuned for more birthday celebration news and events. « St. Luke School Motto: Preparing Minds. Living for Christ.